A New Take On Sequins! Holographic Square Sequins Mesh Fabric gives a new look to a long-known style. Rather than round sequins, this fabric was designed with square sequins. These shimmering scales have rounded edges and are attached by one corner, creating a dangling look. Their holographic aspect makes them shimmer and shine in different shades as the light catches them. Combined with the mesh backing they are sewn onto, this design makes for a light and airy fabric. 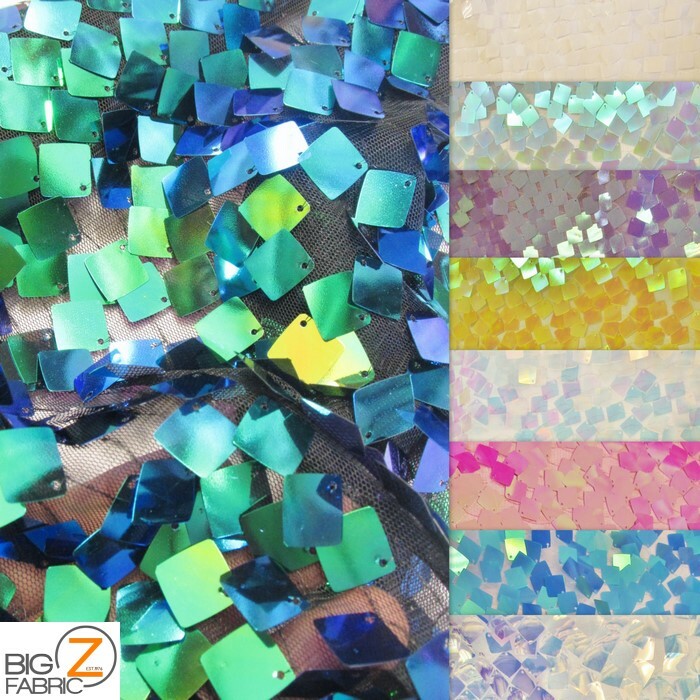 It will create a lively look with any movement as the sequins, reminiscent of fish scales, dance and glimmer. This fabric would be wonderful as a dress, as movement will show off the sequins to best effect. It would also work well as a scarf or home decoration. A more unusual option would be to use it as a room divider or curtain. This fabric has a width of 51 inches and is made of polyester. It is available for 21.99 per yard, and for $1 you can request a sample. 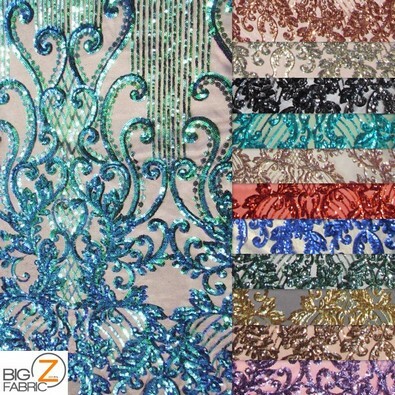 Bring a bit of shimmer to your next project with this astonishing fabric! Posted in Nylon Sequins Fabric	| Tagged holographic, Sequins Fabric, square sequins	| Comments Off on A New Take On Sequins! Velvet-Backed Sequins For Your Next Project! Looking for sequins? Do you need a wide choice of colors and sturdy backing? 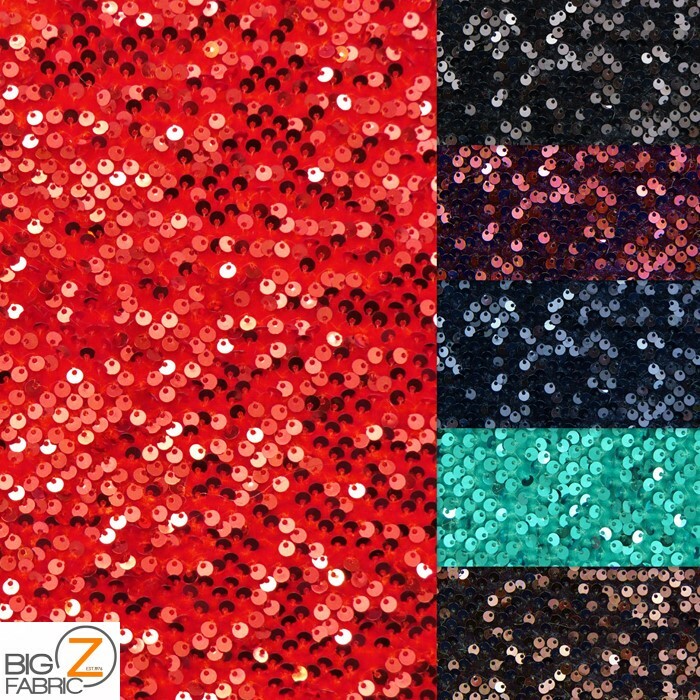 Then Rain Drop Sequin Stretch Fabric may be perfect for you! It features a velvet backing, giving it additional weight and stability while still keeping the shimmering, beautiful look you’re used to. With 13 colors to choose from, you’ll be certain to find one that fits your needs. Options include Eggplant, Black, Silver, Fuchsia, Navy Blue, Red, and Turquoise. Whether you are going for a bright, festive look or a more professional, subtle look, you’ll be able to find the shade that fits your project. This fabric features carefully placed 1/8″ sequins, and the fabric comes in a width of 55/60 inches. Rain Drop Sequin Stretch Fabric is made of polyester. It also has a two-way stretch, making it comfortable to wear. This unique, wonderfully glimmering fabric is available for $14.99 per yard. If you’d like the chance to see this fabric in person first, you can request a sample for just $1. Posted in Nylon Sequins Fabric	| Tagged rain drop sequins, Sequins, Sequins Fabric	| Comments Off on Velvet-Backed Sequins For Your Next Project!